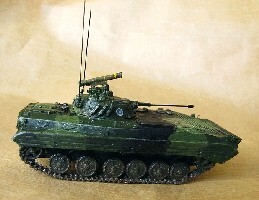 As with many limited run kits the BMP-2 looks somewhat modest in the box. There is a fair amount of flash and some parts look softish. A closer examination reveals that there is nothing actually wrong with the kit, however, the molding is sufficiently crisp and the part layout is logical. Also the details are abundant, but because of the flat white plastic they are hard to appreciate at first sight. Only the relative crudeness of the hard plastic tracks leave room for some criticism. 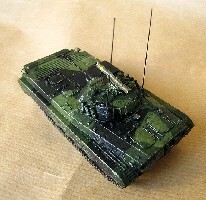 ACE has a reputation of representing it's subjects accurately and based on photographic evidence I would say this holds true for the BMP-2 kit as well. I did not perform any measurements, but relied on the famous "looks good to me" method, so there is a chance of me being proven wrong. The plastic is rather soft but not brittle, and it is easy to work with. The instructions are simple "explosion diagrams" and a bit unclear in that they do not suggest any building sequence. 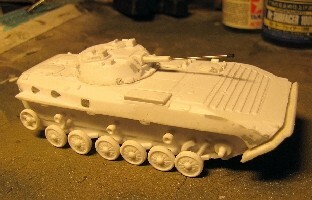 Also the positioning of many smaller parts is not shown clearly, especially on the turret. The decals are very few, but their quality is alright. 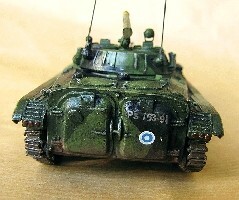 As I wanted to build this kit into a Finnish model, the kit's decals were not used. Putting the hull together is a straightforward business. There is not much to tell about it except maybe mentioning that true to my style I planted some weight inside the chassis to give the model some "substance". In the test fitting phase I discovered a gap between the back panel and the hull bottom, which I plugged with a strip of styrene. After studying the part fit I considered it would be better to attach the back panel first to the hull top and only later assemble it with the rest of the chassis. This lead to some fit issues both around the rear and in the nose area, but in the end they were conveniently masked by the fenders and nose top plate plus some putty. To increase the detail level further I did some small additions, although the kit itself is almost surprisingly complete in this respect. The rear side panels omit gun ports for the infantry passengers, so I cut these drop shaped hatches from foil and glued them on. I also made guard rails from wire for the headlights and one hatch handle. Furthermore, I added lights both to the front and back fenders simply by cutting discs out of a styrene rod. I also planted curved styrene plates between the rear entry/exit doors, as my references have it. 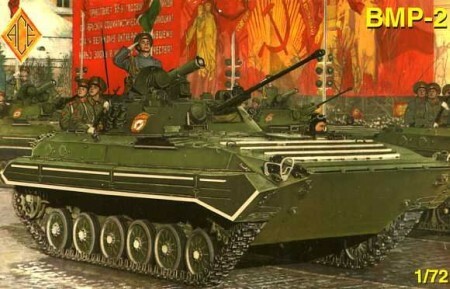 The BMP-2 has a simple road wheel system with single wheels. This makes the construction fast and easy. A somewhat annoying detail is that the wheels are of varying thickness, an error in the mold itself, which could be corrected by resin casting some new wheels. I accepted the faulty wheels, though, and luckily the error is hard to spot on the finished model. Another error, this one my own, is that I missed the inclusion of suspension bars for the second road wheels partly because of the obscure instructions. I was aware that such should be there, but did not notice that the parts for these were actually provided with the kit. 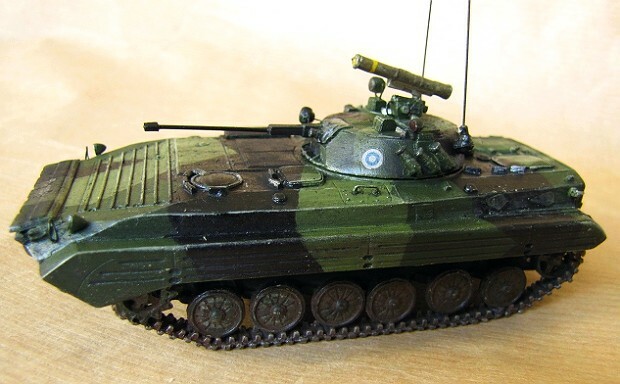 This and some other discrepancies are caused by the fact that the kit seems to share certain parts with the BMP-1 kit, where such details are different. I opted to leave the suspension bars out and only noticed the required parts on the sprue when the building had proceeded too far to install them. Oh well! I really dislike using link-and-length tracks when they come with a model that has narrow tracks with small individual links like the BMP has. Putting them on was quite a chore, as anticipated, especially because they were riddled with flash. Also thick connecting sprues made the separation of the track links a nasty business. On the plus side, there is a considerable amount of extra track links on the sprues, so it is not a disaster if some of them get lost or ruined (as they usually do). Some teeth need to be cut off from the sprocket wheels to ensure a satisfying fit of the links. My building sequence is normally "old school" in the sense that I tend to build and paint my models in sub-assemblies and mate them only after they are primed. This was the case now, too. This time I did not paint the tracks and wheel tyres before mating, however, but finished them only after the chassis was put together. The shallow overhang of the upper body made this quite easy. The turret itself is very simple and only requires putting the gun and hatches in their place. Some shallow dents on the turret sides had to be puttied and smoothed, though. The turret carries an array of different equipment and most of the small parts in the sprues are meant for the turret top. Their precise locations need to be checked from actual vehicle photographs, since the instructions are quite vague on these. Some of the parts require a fair amount of cleaning and for instance the antenna mounts are portrayed very heavily. I did some modifications of my own. Most importantly I swapped the gun barrel to a new one made of an injection needle. I also replaced the bulky searchlight frames with new ones bent out of metal wire. The stand for the anti-tank missile launcher is originally a very crude block, which prompted me to spice it up with some small details made of foil, wire and styrene. Two antennas, as in every real Finnish "Bemari", were made of heat stretched sprue to give the model its final touch. The Finnish army uses a three-tone camouflage of two greens and a black for ground vehicles. 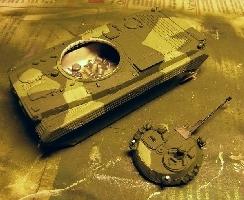 I chose the paints again from the Tamiya acrylics range, the green being XF-58, the lighter green shade toned lighter with white and the black being the XF-1. It would have been logical to start with the lightest shade, but as the base color in reality is the darker green, I followed that order too. 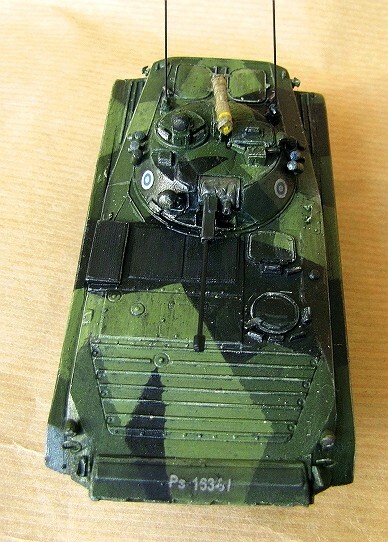 I suspected that the application of the "splinter" scheme on an uneven surface with straight edges would be difficult using an airbrush, so I painted the camo fields freehand with a brush. The straight edges were rather challenging, but I´m quite satisfied with the result. Highlighting was then given with a brush to the edges and raised details and a black wash was performed on the top of everything ("old school" style). Some small scratches and paint wear were simulated using a pencil. The markings are from another vehicle sheet, but since the registration number was not quite right (I needed a Ps. 153 but had a Ps. 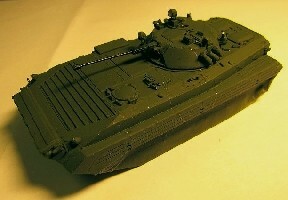 163), I customized it slightly with paint. Previously I have sprayed my Finnish vehicles with a satin varnish slightly toned with gray, but now I think this has subdued their colours too much. This time I omitted the toning and only used the clear varnish spray topped with some local pastel chalk treatments. The result is that this BMP-2 is now the most colourful and lightly shaded of my modern models, which makes it stand out, but not in a bad way. As said in the beginning this kit does not look like much in the box, but it builds easily into a rather pleasing representation of this Russian infantry fighting vehicle. With even more super-detailing and better finishing skills the results could be all the more convincing. 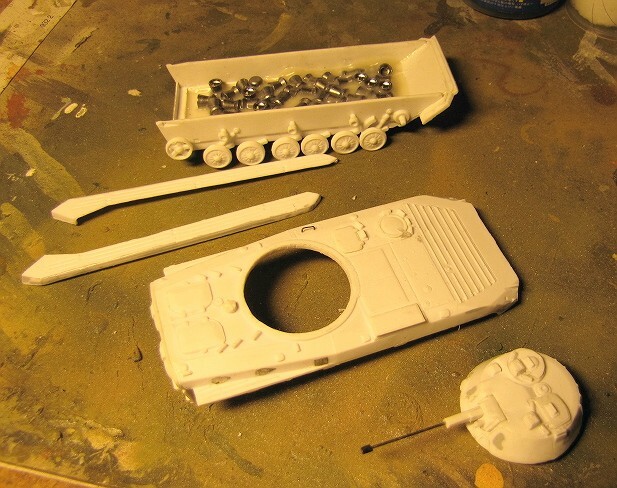 This is an ACE kit that gives the modeller a very good starting point, and it is up to the skills and ambition level of the builder to see how far he can go.